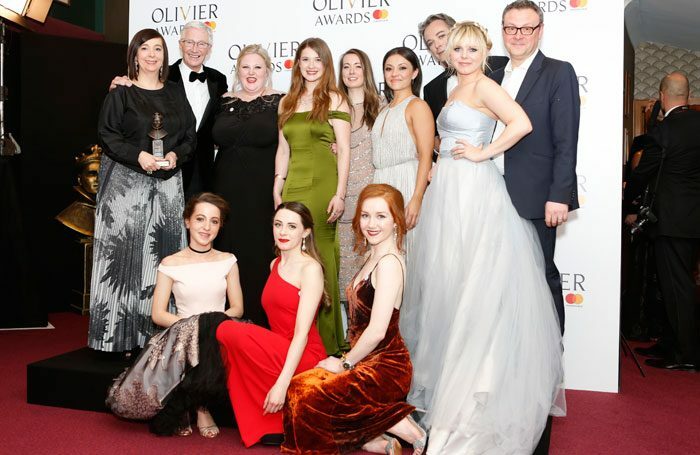 Oliviers 2017: Mark Shenton – Do the Olivier Awards need a rethink? So it was virtually a clean sweep for Harry Potter and the Cursed Child at the Olivier Awards. It had already set the record for most nominations of any play in history (11), and then translated those into a record number of wins (nine). It failed to land just two of the awards it was nominated for: choreography and achievement in music. But it meant slim pickings for everyone else. The only other plays to be recognised in the major categories were Yerma, named best revival (though in fact it was a complete overhaul of Lorca’s original) and for which Billie Piper deservedly won the best actress award, while Lee Hall’s West End-bound Our Ladies of Perpetual Succour was named best new comedy. The major musicals divvied up the awards between them: two for Groundhog Day (the all-important best musical award and best actor in a musical for Andy Karl, which will help speed it on its way to Broadway, where it opens officially on April 17); two for Dreamgirls (for star Amber Riley and supporting actor Adam J Bernard); two for Andrew Lloyd Webber’s three nominated musicals (with Jesus Christ Superstar named best musical revival and School of Rock‘s three sets of children’s bands taking the award for outstanding achievement in music); and two for Matthew Bourne’s dance-based piece The Red Shoes (best choreographer and best entertainment and family). There was also a solitary but deserved win for Rebecca Trehearn as best supporting actress in a musical for Show Boat. So that’s a sum total of nine shows that were rewarded across 21 theatre categories (excluding the stand-alone achievement in an affiliate theatre). Strikingly, only three of those shows originated in subsidised theatres: Our Ladies of Perpetual Succour, which came to the National via the National Theatre of Scotland; Yerma from the Young Vic; and The Red Shoes produced by New Adventures at Sadler’s Wells. The re-engineering of the nominations and judging process has resulted in a decisive shift towards honouring commercial shows. This could be an accident of artistic process that simply indicates commercial theatre produced better shows than the subsidised sector last year. However, it should also be noted that Harry Potter’s decisive wins were achieved by talent that had come through the subsidised sector, so the commercial theatre has been its beneficiary in any case. It must have been bittersweet for Vicky Featherstone to collect an award for a show that had originated not at her resident theatre, the Royal Court, but under the auspices of her previous home, the National Theatre of Scotland, in partnership with Newcastle’s Live Theatre. The Royal Court failed to secure a single nomination. But then it was in good company, with the Almeida similarly excluded. Regional theatre already has its own separate ceremony, the UK Theatre Awards – promoted by the Society of London Theatre’s sister organisation UK Theatre and held every year in the grand surroundings of the City’s Guildhall. But leaving that aside, there’s also the sheer impossibility of devising a judging process that would enable regional shows to be included on a level playing field. We’re already seeing the skewed results produced by the renewed emphasis on commercial shows; adding in regional theatre, which very few of SOLT’s membership – that votes on the awards – would have seen makes it even less fair. That’s not to say that the judging process couldn’t or shouldn’t be changed to address this. But I’m not sure that the existing nominations, limited to four per category, could sustain the pressure. As it is, many awards-worthy shows and theatres are already excluded from being nominated (what happened to the Almeida’s Mary Stuart in the Oliviers this year?). That would only increase once Manchester and Sheffield started taking slots. Those slots could become even more limited if MTV’s new awards model takes off. The entertainment company has revealed it will make its acting awards gender-neutral, so a single acting category will be open to both male and female actors. That might make sense with instances such as Glenda Jackson’s Olivier nomination for best actress for a male role (King Lear). But while reducing the number of awards might reduce the ceremony’s running time, it would also increase pressure on places in the shortlist. The Oliviers could clearly do with another rethink to introduce more expertise over partisan interests. But embracing the regions and changing the current battle lines of gender might be a step too far.